In 2011, Boston changed its food policy regulations to allow for food trucks vendors. While many other large cities made the change previously, the food truck movement remained relatively muted, as it was seen as a financial risk. However, Boston made an active effort to reinforce this movement by designating several special parking locations and scheduled trucks at each primed position. Thus, Boston’s food truck revolution shot off with notable restaurants on wheels like Roxy’s, Bon Me, and Chicken and Rice Guys (which come to Harvard Plaza). In 2012, Mei Mei joined the race. 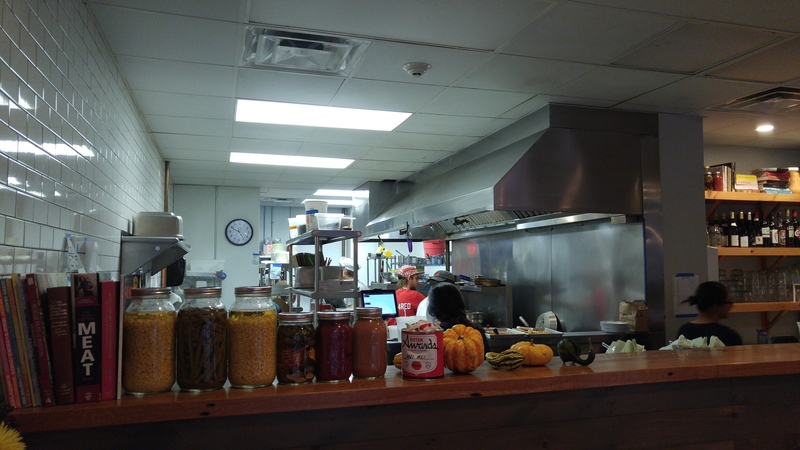 Mei Mei specializes in Asian Fusion cuisine and incorporates international flavors into its classic Asian cuisine. “Mei Mei” translates to little sister, which is a reminder of the family that runs the truck. Started by an older brother with his two younger sisters, Mei Mei brought forth their traditional Asian techniques combined with exotic global flavors. Almost immediately, the food truck shot out to incredible popularity and was named Boston’s best food on wheels. In 2013, they opened a brick and mortar location near Fenway Park and have continued their trend for elegance with top honors from Eater Boston and Boston Magazine. 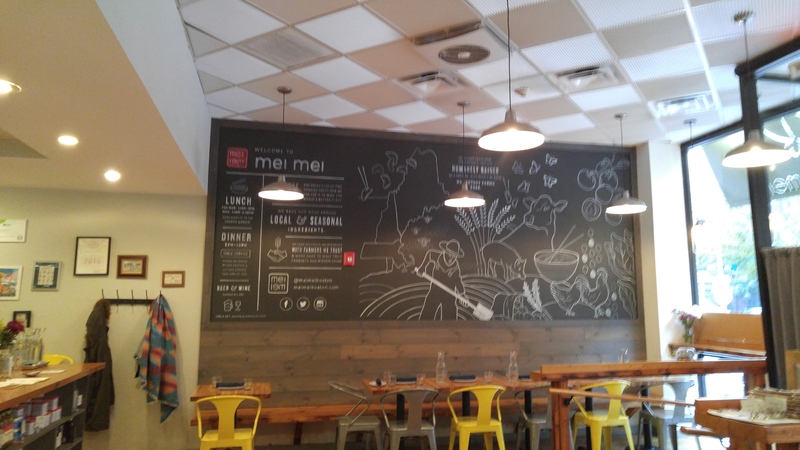 Mei Mei’s restaurant in Fenway is a short walk from the T stop and conveniently located near Boston University. My friend and I arrived exactly between lunch and dinner, which proved to be a significant shift at the restaurant. 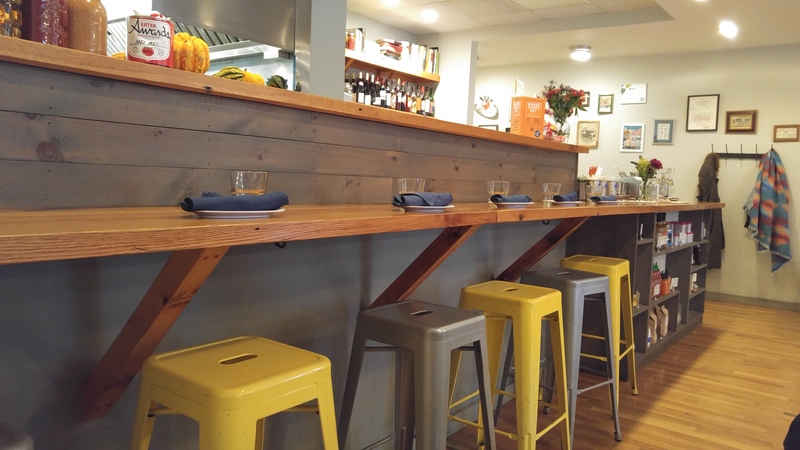 Transforming from casual lunch counter to a more sophisticated sit-down establishment, Mei Mei demonstrates incredible versatility in its restaurant model. After placing our orders at the counter, we sat in the empty restaurant and waited comfortably for our food. As the aroma began to waft from the open kitchen, I snuck in a glance and watched the final trays being assembled. When our names were called, we rushed to the counter and grabbed our lunch trays, reminiscent of our high school years. With the famous Double Awesome, a braised beef porridge, and a steamed bun with compound butter, I stared at my tray contently. My friend’s pierogi dumplings and rib tips accompanied his Double Awesome, as we snapped our pictures before digging in. 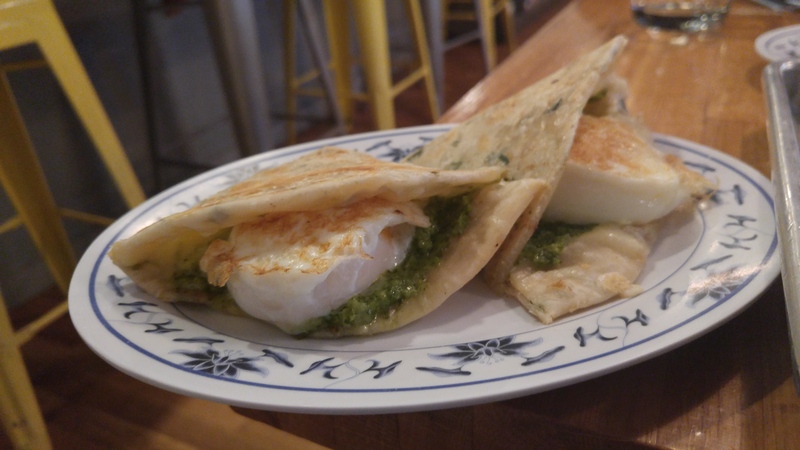 Mei Mei’s Double Awesome is regarded as one of the best “sandwiches” in Boston, with a scallion pancake caressing two beautifully fried eggs with pesto and cheddar. 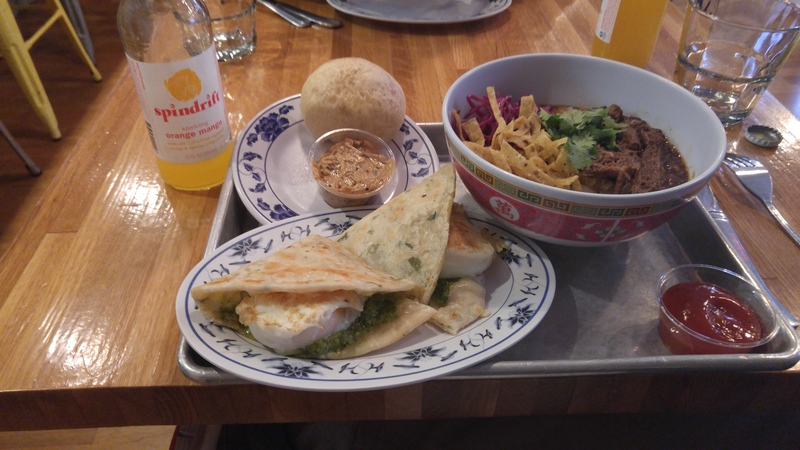 Utilizing the Asian scallion pancake as a “wrap” for non-Asian ingredients like pesto and cheddar is a testament to Mei Mei’s Asian Fusion brand. As I bit into the soft, but crisp pancake, the egg burst open, releasing its rich yolk to mix with the earthy pesto and creamy cheddar. While somewhat difficult to eat, the Double Awesome is exactly as promised; it is indeed awesome. The untraditional pesto, mixed with chives and other Asian herbs, provided the necessary green to balance the liquid egg yolk and melted cheddar. It is difficult to describe the savory mess that this becomes as the egg yolk drips from the wrap, but I promise you it is worth it. If you ever have the chance to visit Mei Mei, the Double Awesome is a must! The rest of the meal proceeded without a hitch, as we vacuumed up our portions. 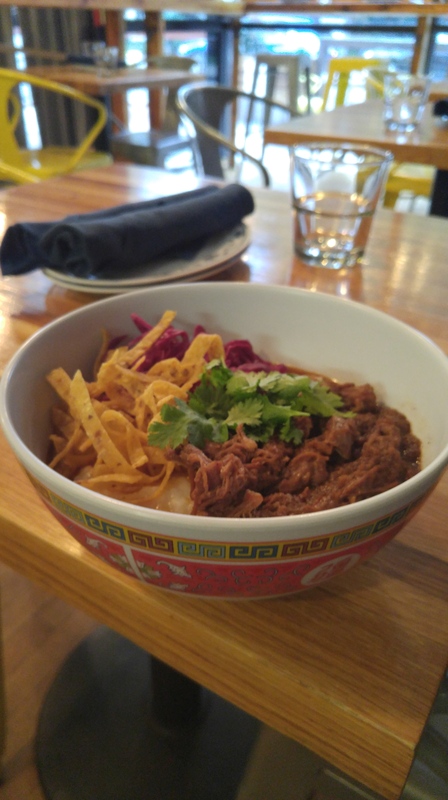 The braised beef porridge with cabbage and tortilla strips seemed bizarre at first, but it was perfectly nostalgic. While the porridge was a little grainier than I was used to, the warm, flavorful broth reminded me of home. However, this was more than a normal porridge. With the salty beef broth, crisp tortilla strips, and acidic cabbage, the dish was perfectly balanced both in flavor and texture. It may have seemed a little peculiar at first, but the dish was the ideal combination of nostalgic flavors from home with exotic accompaniments. While I enjoyed my meal, I had a quick sample of my friend’s portions. Pierogis are essentially Eastern European style dumplings with potato fillings, and I was surprised to see them on the menu. Surprisingly, they were exemplary with a smooth, but spicy potato filling in the fried skin. With the traditional Asian dumpling shape and an untraditional filling, they again filled me with a weird sense of nostalgia. Finally, we had the rib tips. Unfortunately, the rib tips, with an amazing sauce, were tough and unpalatable. The little meat that could be salvaged was delicious to say the least, but overall, this was the disappointment of the night. Satisfied with our meal, we left the cozy little shop into the crisp Boston evening. 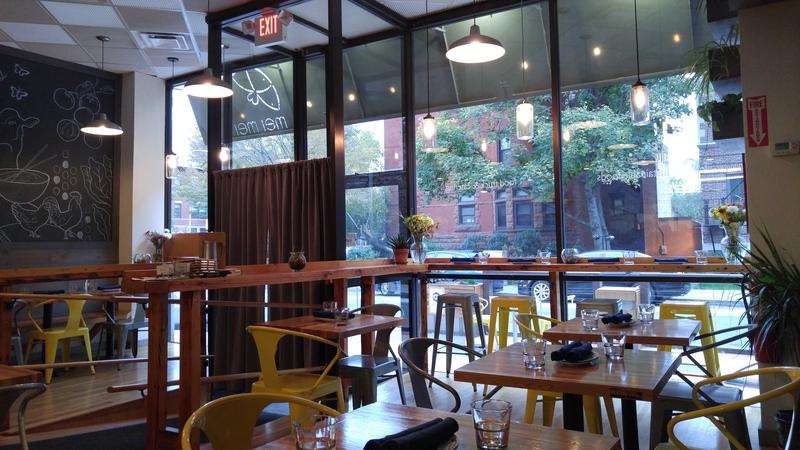 Mei Mei is considered one of Boston’s best restaurants, and it is obvious why. 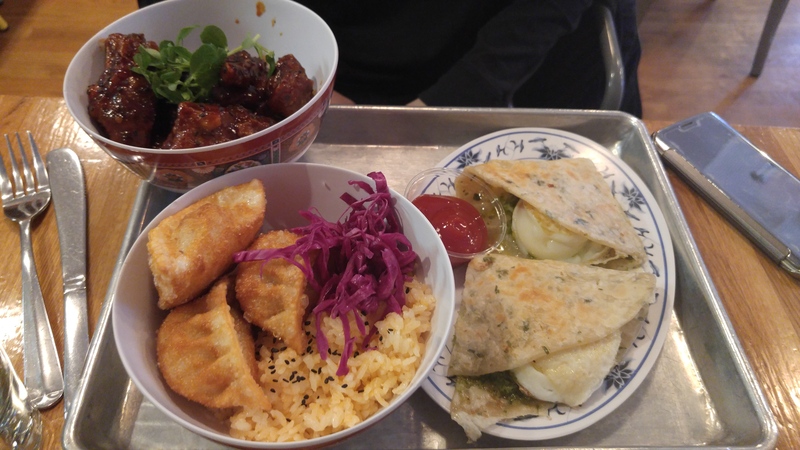 For Asian Americans, it is the perfect place to be hit with nostalgia, while simultaneously exploring other cuisines. For everyone else, it delivers dishes that are both familiar and foreign at approachable prices. It serves as the perfect canvas for people to try cuisines that they are not accustomed to. I look forward to my next visit to Mei Mei and what other nostalgic noshes I will experience.